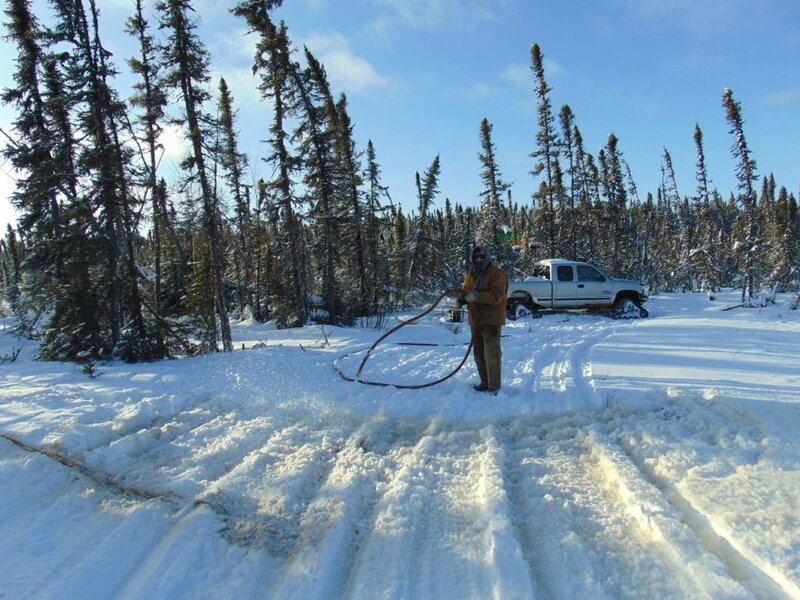 on day 2 we have gone as far as we can go with the KoO-Tracks without sinking the truck in the non-frozen muskeg. 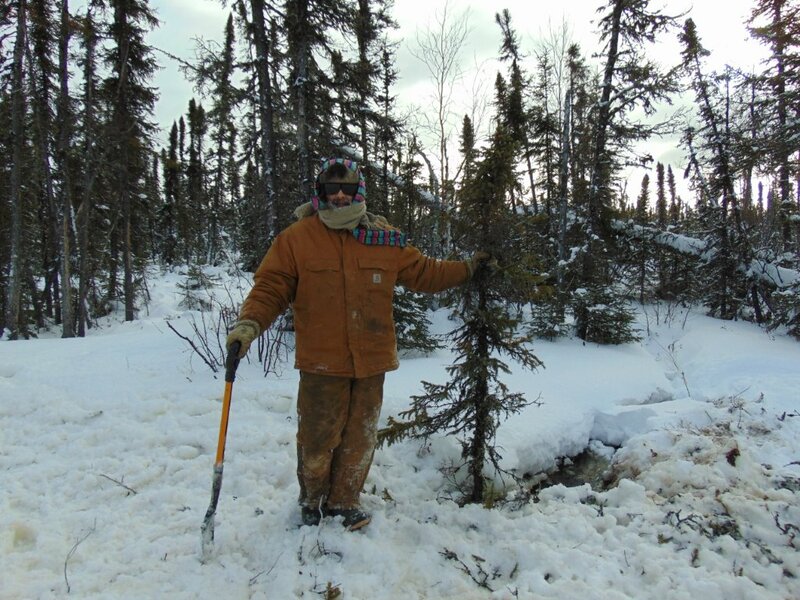 also the water is at record high levels in the bush so that means we have to work extra harder to get the ground to freeze. 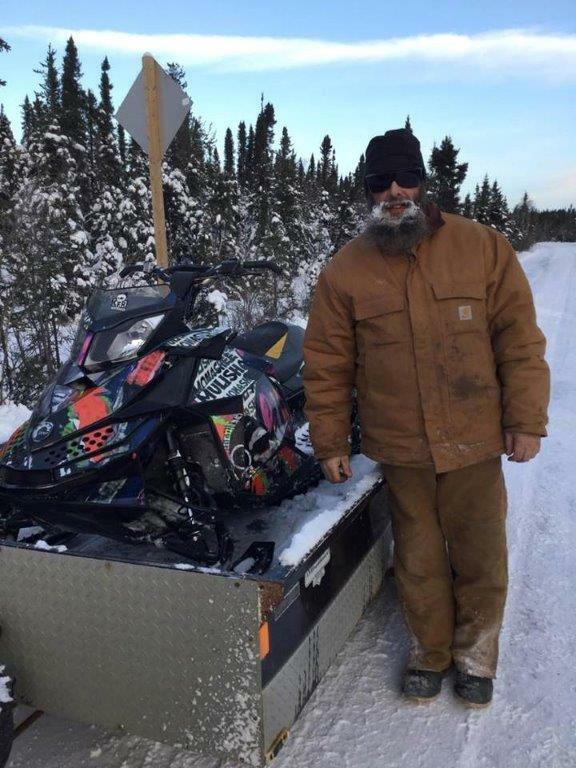 at -25c my son Xena was not going to drive her ski-doo the 10 kms to the start of the west side so we towed it and she listened to 80s heavy metal music in the Pink Crew Cab with me. 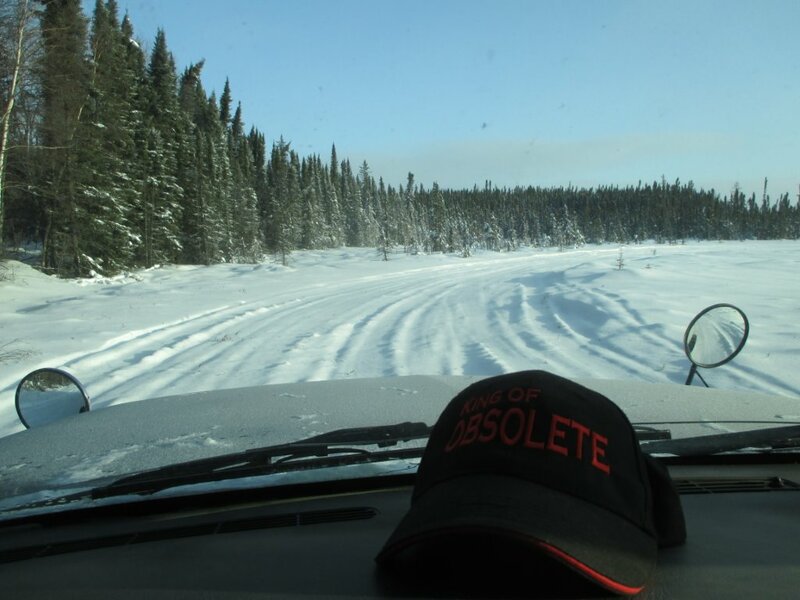 the first thing we did when we took the ski-doos out on the drill roads was head to Fraser Lake to see just how high the water levels are this year. last year the lake level was 24" lower then the ground but this year the water level is even with the ground. 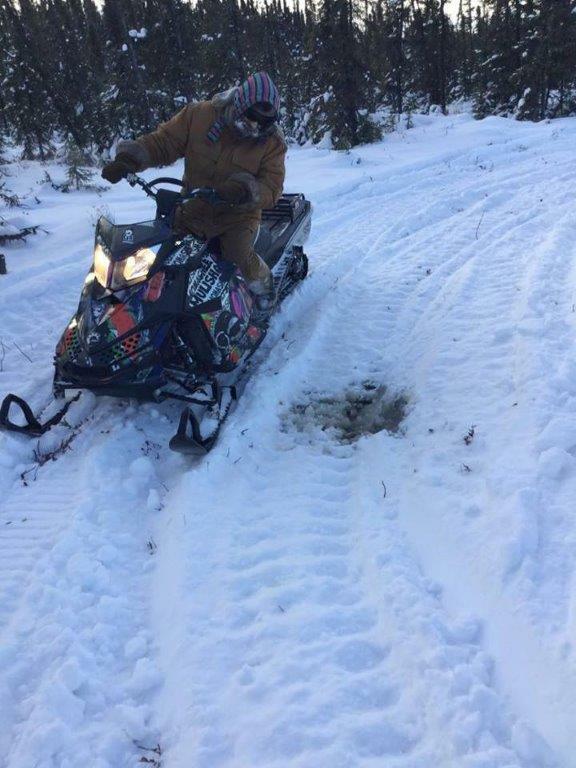 this is not good plus you can see the brown spots in the ski-doo tracks that is water that was under the snow. next we start going back and forth packing the snow down to take the fluff out of it. we are having lots of problems due to the fact there is water under the snow that was not there last year. plus the ground is not frozen enough to support our body weight when walking around. 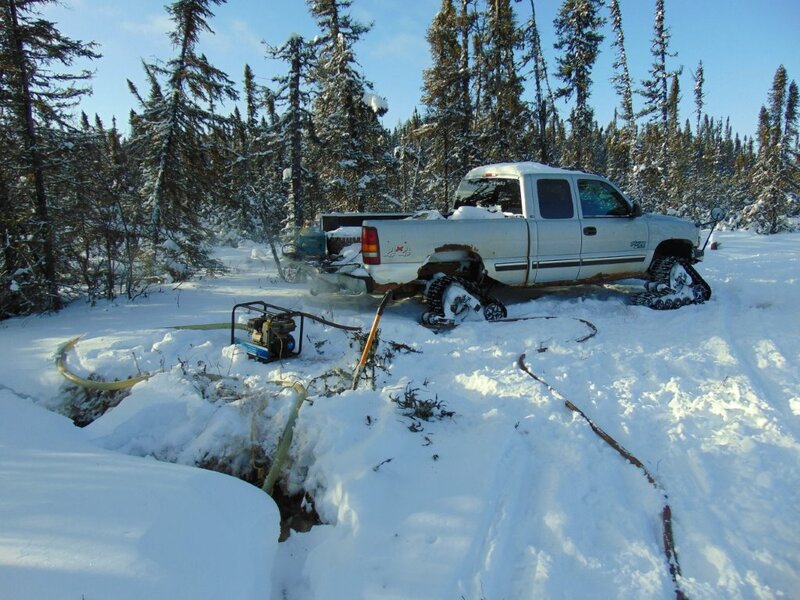 the conditions are so bad in the bush on our drill roads i did not take out one of the 3 skandic work machine for packing because they would only sink in the wet non-frozen muskeg. instead i chose the 800 summit ski-doo that came from the mountains in British Columbia with a tuned engine and 3" paddle track. the machine is known as the "machine of death" because it will do 100mph but turning and stopping is a problem. the machine is design to be ridden standing up and you use your body to turn it in the deep snow because the small little skis are never touching the ground. 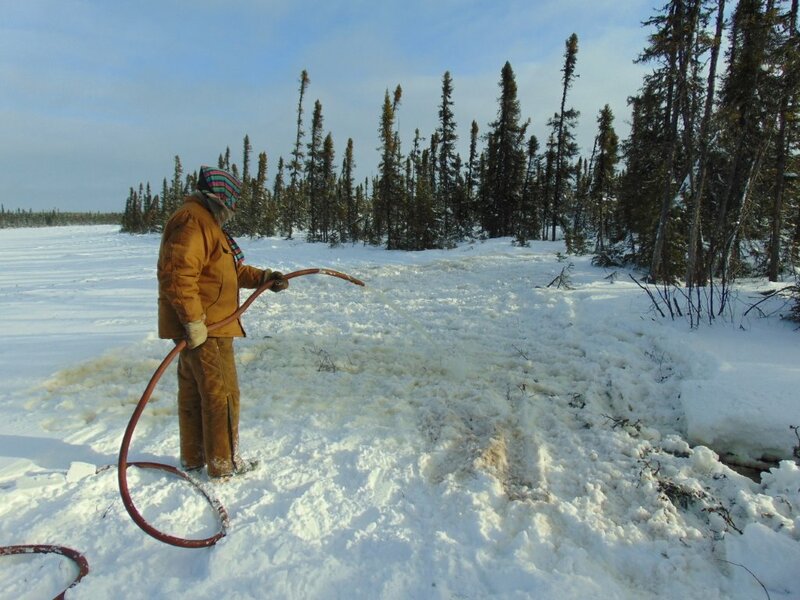 this wet spot is a 12 foot deep vent hole in the muskeg we don't want to freeze because it is venting the heat from the muskeg out so the ground will cool down and freeze faster. 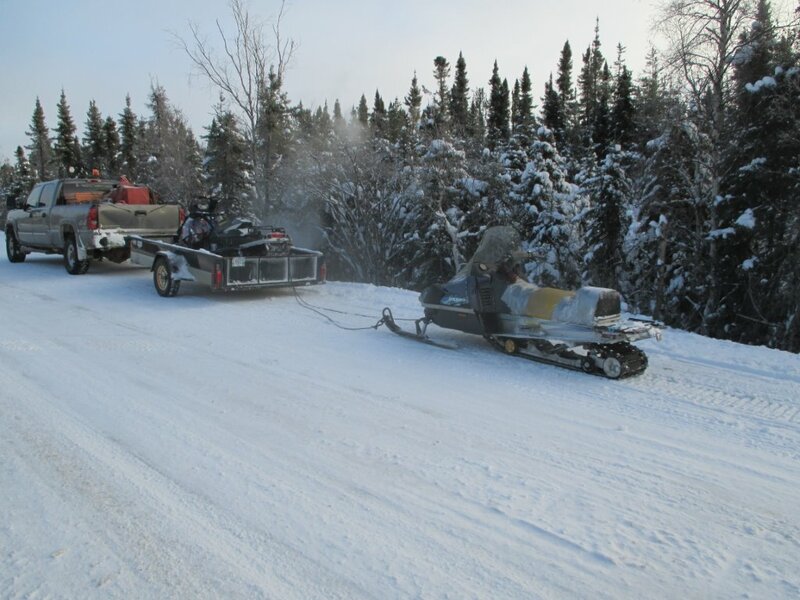 with all the packing completed by the ski-doos on the west side, we load up to head back to the Kingdom. i feel like Wile E. Coyote that has ridden his acme rocket chasing the road runner because i fell off the 800 summit numerous times today. 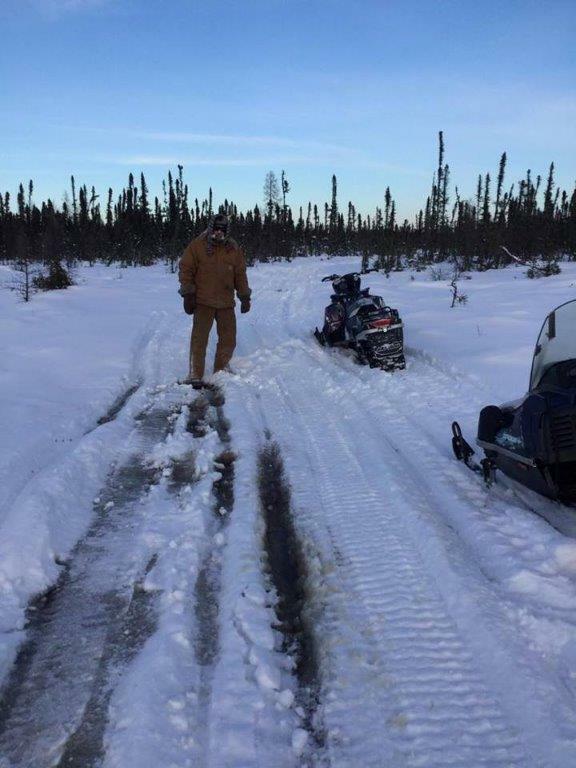 it is a young person ski-doo not a 50 year old man trying to pack watery snow so it freezes. my son Xena snapped this nice selfie of me and the Machine of Death. 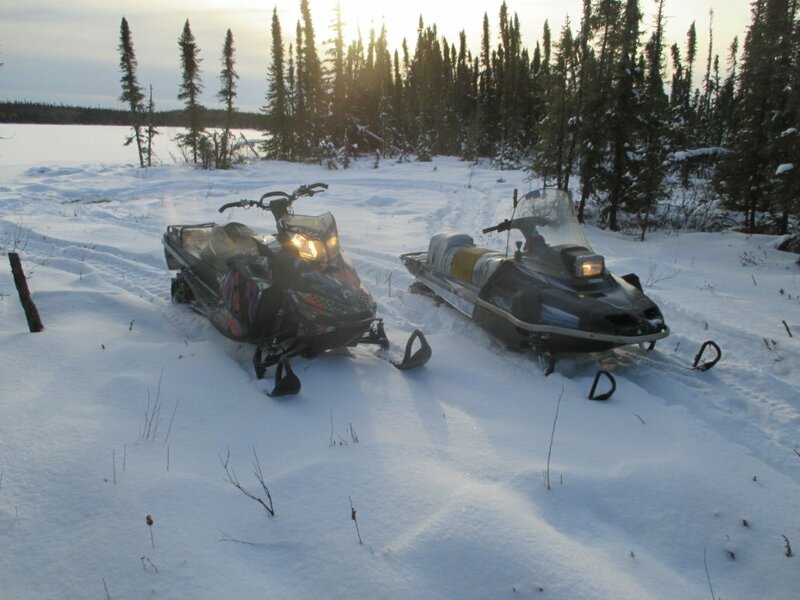 on day 4, the ski-doo packing has had a chance to freeze up nicely so now it is time to flood the bad creek. 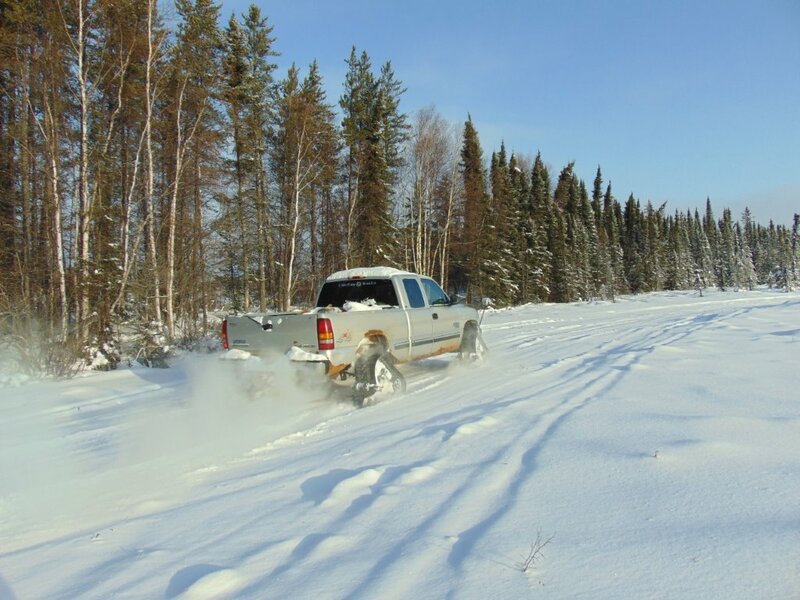 the KoO-Tracks have no problem traveling around the edge of a non-frozen lake. the view from inside the KoO-Tracks as i drive around the edge of the lake. fear and common sense is not stopping me. 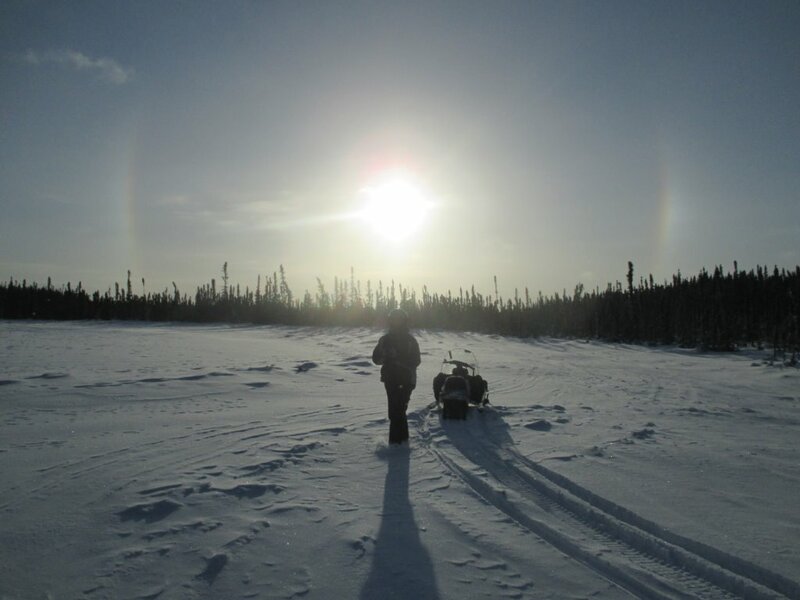 traveling the portage was no problem so i stopped for a picture as i came out on to swamp lake 2.
my son Xena with her obsolete ski-doo made for a prefect photo with the sun dogs around the sun. the sun dogs are clear and long so that means cold weather is coming. 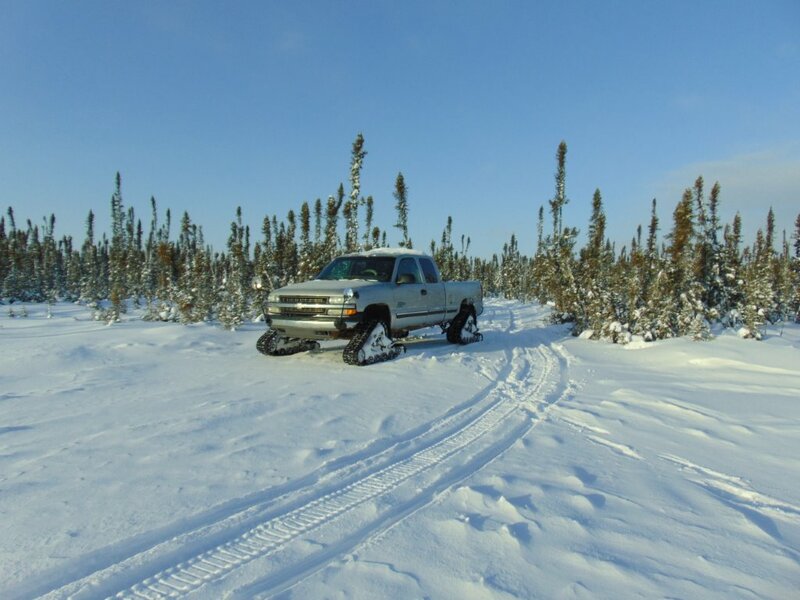 with the KoO-Tracks i had to back up 300 meters to the creek because the ground is not frozen enough for the truck to trun around. 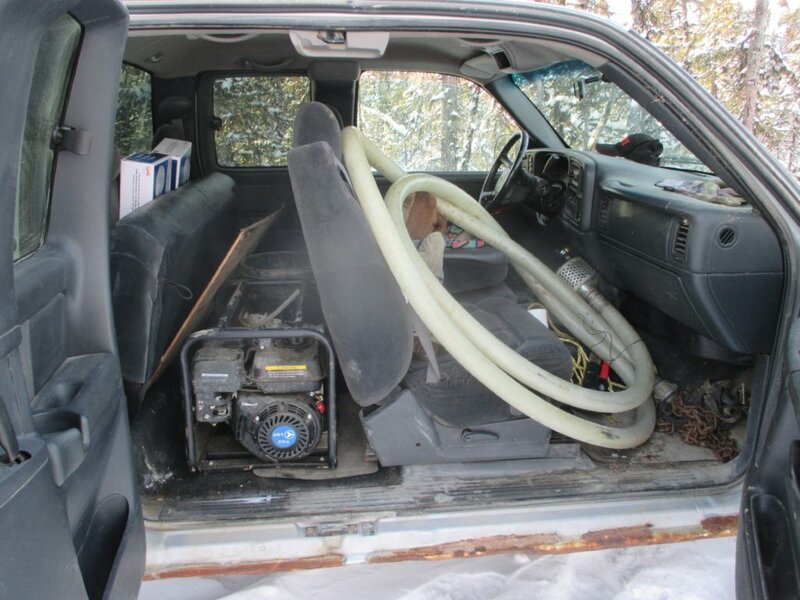 the joys of a full size chevy truck, all the flood equipment can stay warm until it is needed. using the water from the creek we begin flooding the snow that has been packed down to be about 6" deep. with wind gusts of 48kmph and a base temperature of -20c, it was very cold flooding the creek. we had great fun trying to walk around on the non-frozen ground plus we did get a few boot fulls of water which made it more interesting. the selfie of the day taken by my son Xena. it is hard to smile with frozen feet and soaked clothes but it is part of the job.